Well its Sunday and it wouldn't be the 1970's if you didn't have a roast on this day. The Bisto Kids featured heavily in the '70's - I personally can't stand gravy it makes everything go soggy where's the sense in that? 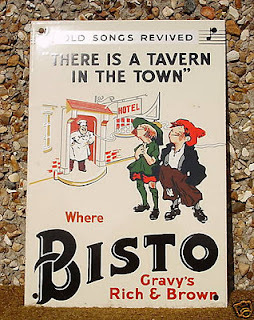 Good job none of us like the stuff (although I don't know if the kids would as I've never offered it up) but if we did then I'm sure I would be calling in the Bisto Kids and not be making it from scratch. In good old fashioned 1970's style I overcooked the lamb today within an inch of its life. It was a bit too pink so I whacked it back into the oven with the potatoes and of course over cooked it. It is the 1970's diet after all. My mum always over cooks meat - her speciality would have to be roast beef. My Aunt Debbie recently gave me a comprehensive list of what she had in the 1970's and it sounded far superior to anything that landed on my plate. I also won (ebay's great isn't it - you win things instead of buying them) "Day by Day Cooking" 1977 by Mary Berry. She featured on the The Great British Bake Off recently. I was actually surprised at the recipes the vast majority wouldn't look out of place in today's kitchen e.g Lamb with Apricots (that is a recipe I have done from my Tana Ramsey book), Steak and Kidney Pudding, Beef Wellington and even moules marinieres. This comes as no surprise as French cooking was the bee all and end all in the 70's. I mean they really were at the top of their game. I think they've rested on their laurels somewhat and need to move with the times as I don't think French cooking is the finest in the world and hasn't been for decades. Some did look pretty ghastly (maybe its just the 70's photography) I must say - Salmon and Noodle Bake, Pork Hongroise (? ), stuffed pork chops, egg mousse, marrow and tomato casserole and where would we be without the celebration gammon? The puddings were pretty safe in this book. The traditional ones and lots of piping going on Fanny Craddock style (more of her at Christmas time). I had never heard of 'Savarin' a curious sponge looking number with cream, syrup, honey and rum. So tomorrow is my weekly weigh in. How will I do? Have I been good or bad? I hate that dieting expression born out of slimming clubs "have you been good this week"? like you're some 10 year old. I remember standing in line once to get weighed when a fellow dieter said "I haven't been bad this week but I think I might have put on as I've eaten too much fruit"! Yes I always find its the fruit that piles on the pounds.